Chute Systems is not just concerned with training soldiers how to jump out of aircraft, as its name may imply. Rather, this South African company is filling a niche in the special forces and paratrooper training market by training soldiers what to do after they’ve landed. “A parachute is just a means of transport,” said Douw Raimondo, co-owner of Chute Systems. “The guys need to know what to do when they’ve actually arrived.” He told defenceWeb that Chute Sytems is “basically a special forces and parachute training company,” which was established in 2003 to cater to a niche in the market. Raimondo said that it was important to note that more and more governments are moving away from training their soldiers themselves, and are instead outsourcing training to private companies, resulting in huge cost savings. Raimondo said Chute Systems offers clients a turnkey solution and provide clients with all instructors and equipment, ensuring a complete transfer of skills. 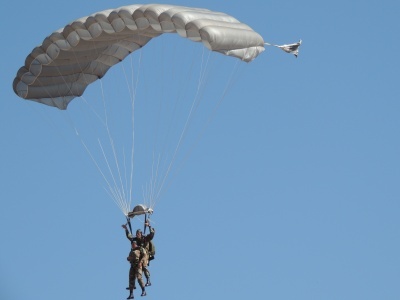 All Chute Systems’ instructors are former South African ‘operators’ (special forces) or paratroopers. “Our concept is African for Africans,” Raimondo emphasised. “Our equipment is tested for Africa and our personnel are used to Africa and its people.” The company employs 15 full-time staff, who together have a couple of hundred years worth of experience – many fought in Angola and other neighbouring countries. “There is a lot of demand for special forces training,” Raimondo said, adding that it accounts for most of Chute Systems’ activities – parachute training only accounts for 25% of company activity. Special forces training takes around 18 months and involves selection and several courses, including survival, minor tactics, seaborne, demolition, escape and evasion and urban warfare. The paratrooper course typically takes nine months and involves selection and a variety of courses, including urban, counterinsurgency, counterinsurgency/rural, static line jumping and parachute jumping. Chute Systems has discovered another niche in driver training (a two month course) and is also exploring ranger/anti-poaching training. “I think there’s a big scope for that,” Raimondo said, especially with the huge amount of poaching across Africa. Maritime security is also a big market at the moment but Chute Systems has no plans to enter that arena. “We would like to focus on our core market of training soldiers and paratroopers,” Raimondo said. Although the company’s main focus is on special forces training, it also supplies equipment such as uniforms, webbing, parachutes etc. – in short, everything the soldier needs bar weaponry, and the company has created the Elite Force Tactical Gear range to meet its equipment requirements. Chute Systems is also the agent for Vigil, which manufactures a parachute safety device that calculates speed and height and automatically deploys a reserve parachute once a skydiver freefalls to a certain altitude. Raimondo said that they have had three saves already with the Vigil system. Chute Systems is also a representative of Parachute Industries of Southern Africa (PISA). AAD 2012 was Chute Systems’ first time at this biennial event. The positive responses generated will ensure that the company returns for the next edition, which will also be held at Air Force Base Waterkloof in 2014.